Background: Phellinus mushrooms are locally available in Thailand. They have been traditionally used for medicinal purposes including tonics, for cancer treatment and for immune system stimulation. Objective: To evaluate the in vitro antioxidant, antibacterial activities and the phytochemical information of the extracts from 11 selected Phellinus mushrooms collected in Thailand. Methods: Eleven Phellinus mushrooms were collected from the Northeastern part of Thailand. Their ethanol and water extracts were tested for in vitro antioxidant activities using a DPPH scavenging assay, FRAP assay and TBARS method while the antibacterial effects were determined by agar disk diffusion and broth microdilution methods. The phytochemical profiles of the Phellinus mushroom extracts were evaluated using TLC and HPLC techniques. The total phenolic and total flavonoid contents of the extracts were evaluated by Folin-Ciocalteu and aluminium chloride methods, respectively. While total carbohydrate and total triterpene contents were evaluated by phenolsulfuric acid and vanillin perchloric acid methods, respectively. Results: Most ethanol extracts from Phellinus mushrooms exhibited moderate antioxidant effects especially extracts from P. everhartii, P. hippophaëicola and P. pini var. microporus while P. igniarius var. cinereus ethanol extract exhibited inhibitory effects to Helicobacter pylori both normal and resistant strains, this extract also showed the strongest inhibitory effect against Staphylococcus aureus. 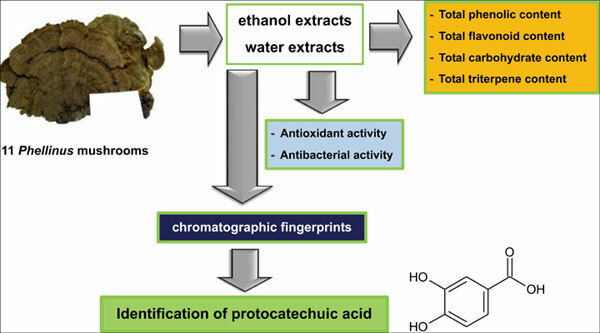 Most Phellinus mushroom extracts exhibited similar TLC and HPLC fingerprints with the chromatographic bands corresponding to phenolics, flavonoids and terpenoids. Protocatechuic acid was identified in most Phellinus mushroom extracts. Conclusion: Phellinus mushrooms especially, P. everhartii could be developed as sources of antioxidants while P. igniarius var. cinereus indicated the potential to inhibit H. pylori. Protocatechuic acid could be used as a marker for quality control of Phellinus mushroom raw materials and extracts. Keywords: Phellinus, antioxidant, antibacterial, total phenolic, total flavonoid, HPLC, protocatechuic acid. Keywords:Phellinus, antioxidant, antibacterial, total phenolic, total flavonoid, HPLC, protocatechuic acid. Abstract:Background: Phellinus mushrooms are locally available in Thailand. They have been traditionally used for medicinal purposes including tonics, for cancer treatment and for immune system stimulation.